Grindl Kuchirka “ Dancing Clown ” sessions are designed to bring more depth to your acting and more soul to your dancing by experiencing the creative movement and dance of the clown. In fact there has been a natural cross fertilization between these two art forms since the first cave man tripped and fell while dancing the great hunt story around the tribe’s evening fire. Experience the essence of Clown, and the simplicity of expressing comedy through movement. Discover how movement can amplify humor, and what lies behind that illusive quality called timing. Explore classical, modern, jazz and free dance, choreography, improvisation and pedestrian movement. Focus on anatomy and learn where the impulse of movement comes from. This workshop is available for clowns, dancers, actors, actresses, directors, musicians and movement artists. Dance experience is not necessary. By playing with the archetypal roles of the Clown throughout history …from romantic poetry to modern tragedy, we will re create the many dances of the Clown from deep profound sadness to uninhibited hilarity AND have a lot of fun! Grindl Kuchirka is a unique Canadian Artist who combines the discipline of the Dancer with the whimsical spontaneity of the Clown. With extensive training in dance and movement as well as 35 plus years of experience as a professional Clown, Grindl has performed her own solo performance in North America, Europe, Japan, Singapore, India and South America. She has created, developed and conducted her “Dancing Clown Workshop” as well as choreographed for Theatre and Television in Canada, France, Holland, India and Brazil. 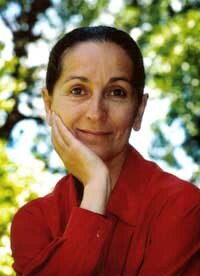 She also plays the lovable Granny Garbanzo on the award winning children show The Big Comfy Couch. Her artistic endeavors have been generously supported by The Ontario Arts Council, Laidlaw Foundation, Toronto Arts Council, and The Canada Council for The Arts.